Once you’ve completed all three reflections, including selecting images and developing titles, save your worksheet, then save it again with a new name, such as: yourname_skill-exp-action_ws_stage2. 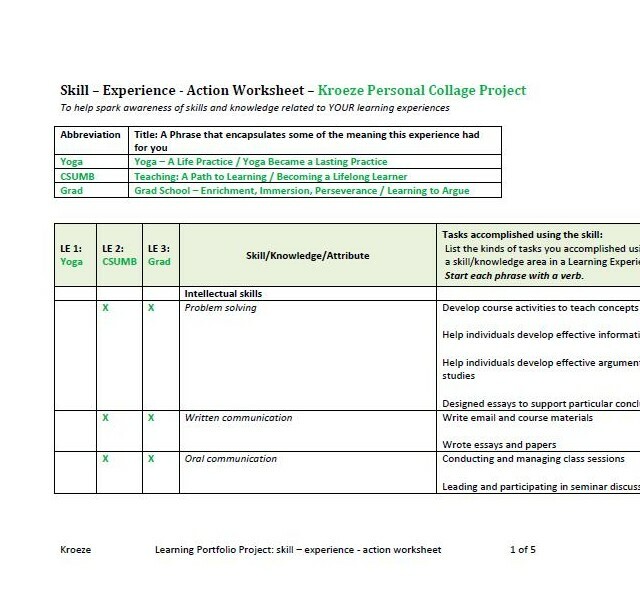 Edit your stage2 worksheet to keep only the skill/knowledge rows that you marked for at least two learning experiences. The purpose for this is to concentrate your final activity efforts in the most used areas. However, if the majority of your skills are only used in one experience, then use your judgement. You can always delete rows later, and you can always insert rows if you want to add some back in. Use the two sections of your worksheet entitled: Particular Strengths Identified During Reflections, and Particular Weaknesses Identified During Reflections, to record your summarized thoughts related to these prompts. You may wish to reread each reflection before recording your summary ideas. Reread your reflections and write down any ideas that come to you about the values, patterns, and themes that consistently influence your actions. Use the corresponding section of the worksheet to record your summary results. If you have the chance, get feedback from someone else on this. Ask someone you do not know very well – like me for example – to read your reflections and give you some outside perspective on the values, patterns, and themes that they believe your experience reflections indicate. You will probably learn something by comparing their list to yours. Use the final section of your worksheet to record any ideas you have about next steps you could take employing strengths and/or weaknesses you’ve identified, in ways that are consistent with your values. You are welcome to examine the worksheet I developed through this process, skill-experience-action worksheet.